This Interview with U A--- describes events occurring in Htantabin Township, Toungoo District in 2017, including interactions with the Kaung Myanmar Aung Company. 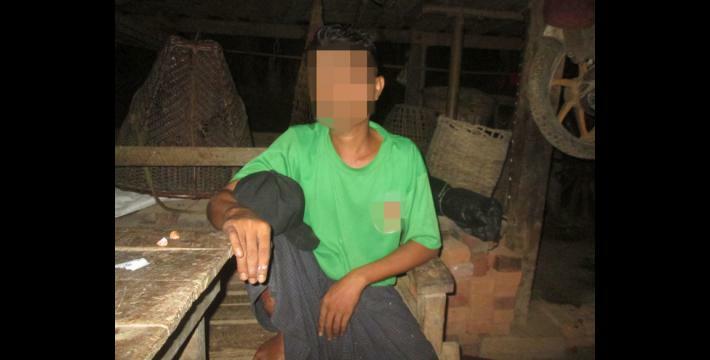 U A--- reported that his employer, Kaung Myanmar Aung Company, ordered him to destroy a villager’s banana plantation in B--- village, Na Ga Mout village tract, Htantabin Township, Toungoo District on 26th October 2016. He had to carry out these orders despite not wanting to because the company threatened him that if he did not he would have to stop working for the company. U A--- stated that the owner of the banana plantation tried to stop Kaung Myanmar Aung Company workers from clearing her banana plantation, citing a lack of consultation prior to the clearing of the plantation. 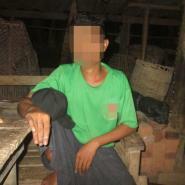 This created a conflict between Kaung Myanmar Aung workers and the local villagers. According to U A---, after Kaung Myanmar Aung Company confiscated the villager’s banana plantation they planted a teak plantation on the confiscated land. However, the banana plantation owner did not receive any compensation. The following Interview was conducted by a community member trained by KHRG to monitor local human rights conditions. It was conducted in Toungoo District in 2017 and is presented below translated exactly as it was received, save for minor edits for clarity and security. This interview was received along with other information from Toungoo District, including 13 other interviews, one situation update, 97 photographs and 11 video clips. My name is U A---. I live in B--- village. I was born in B--- village. Na Ga Mout village tract. Which company are you working at? I am working at the Kaung Myanmar Aung Company (KMAC). Who asked you to cut the banana trees? Kaung Myanmar Aung Company staff? Yes. They asked us to cut the banana trees. They are the managers of Kaung Myanmar Aung Company. There are two managers. Ten workers are led by one manager. They are Thein Zaw Oo and Ko Win Naing. They ordered us cut the banana trees. Are they Kaung Myanmar Aung Company’s staff? Yes. They were ordered by the company to manage the workers. Can you tell me what happened [when you had to cut the banana tree plantations]? That day we went to cut banana trees, because we had been ordered to [by the senior staff of Kaung Myanmar Aung Company]. I heard that there are more than 600 banana trees in the plantation. There were 21 people [KMAC workers], including myself, who went to cut the banana trees. Yes. There were 21 people in our group. Whose banana plantation was it? This banana plantation is owned by a local villager. What is the name of the banana plantation owner? The name of banana plantation owner is Daw C---. We went to cut down her banana trees. The banana trees were just banana shoots [young plants] so with a knife it was easy to cut them down. We had to cut the banana trees, we did not want to cut the banana trees but we were ordered to cut them down. There was 0.50 acres of banana plantation that we had to cut which was divided into two. There was 0.30 acres of banana plantation on one side and there was 0.20 acres of banana plantation on the other side. 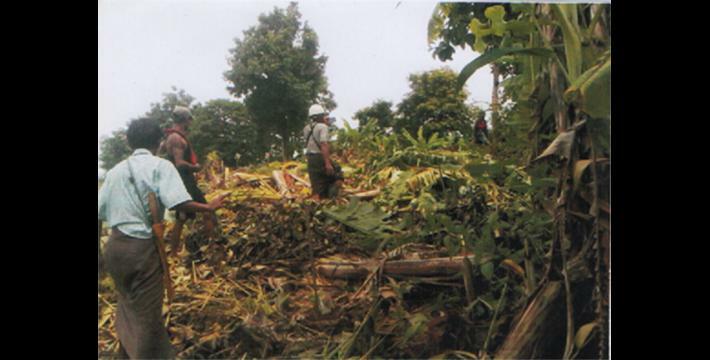 Our group was told to cut the banana trees on the 0.20 acre plantation. The other group had to cut the banana trees which were on the other side. However they had to leave the plantation before finishing cutting the trees as when they went to cut the trees a conflict broke out between them and the villagers. While we were cutting the banana trees, the villagers took our photo. My face was clearly visible in the pictures but none of my crew’s faces were visible. I looked at them [the villagers and their camera] while they were taking pictures. Thein Zaw Oo and Ko Win Naing had asked us to cut the banana trees but we do not know who ordered them to tell us to cut the banana trees. We are just ordinary workers so we have to do whatever they ask us to do. Were there trees that could produce banana fruits? No. All of the banana trees were just small, they were young banana trees. However, we were asked to cut all of these banana trees down. Did you have any problems or conflicts with local villagers when you went to cut the banana trees? Yeah. We had a conflict with local villagers. We were ordered by Thein Zaw Oo and Ko Win Naing to cut the banana trees so we went to cut the trees. While we were cutting the banana trees, the banana plantation owner fired her sling shot at us. We stopped cutting [the plants] and ran away. The other villagers were waiting for us at the other side [of the plantation] and they were holding knives. We are just ordinary workers. We do not want to make any conflict with local villagers because we are also the children of the local villagers. However, Thein Zaw Oo and Ko Win Naing ordered us to continue to cut the banana trees. We told them that we do not want to do it anymore. Then they [managers] told us to wait until their leader came. Their leader is U Soe Paing, who is in charge of security. He [U Soe Paing] phoned the senior leader of the company [to ask for instructions]. Then our group had to leave [because of the conflict] but the other staff continued to cut the banana trees [on the other half of the plantation]. Who was ordered to continue to cut the banana trees? The staff from KMAC? So how many people [ordered to cut banana trees] were there? There were 21 people but three other company staff came to cut the banana trees too. So the total was 24 people. How long did it take to cut the banana trees in the plantation? Did the company give compensation to the villager [plantation owner]? No. They did not give compensation to the villager [plantation owner]. That is why the banana plantation owner tried to stop us [from cutting down the plantation]. Can you tell me, to the best of your knowledge, what does the company plan to do after the banana trees have been cut? The company plans to make a teak plantation on the old banana plantation. I heard that the company already returned some of the banana plantation to Daw C---. However, the banana plantation owner said, “if the company continues to confiscate my land I will protect my plantation with my life. This plantation will be the legacy of my children”. She provided a lot of detailed information about this case. At that time we decided not to cut the banana trees and we wanted to go back [to our village]. Yet, they [KMAC employees] told us to wait until their leader came. When their leader came, he [their leader] phoned the senior leader of the company to make a decision. Then we moved back to our village. We have admitted that we have cut the banana trees. How did the leaders [of the company] solve the problem? The leader just talked to the senior leader of the company over the phone. The senior leader of the company ordered him to move away from the plantation. That is why we moved back. However, we were asked to go to cut the banana trees again but we did not have a chance to do so as when we went there villagers were waiting there to stop us so again we returned. Yet another time, we were ordered to go to and cut banana trees. There were 34 villagers at that time. When the company went to confiscate her land, did the conflict occur between the company and her? I do not know much about how many times the conflict happened between the company and her. Yet, twice when we went to go to cut banana trees, conflict occurred. We went there two times but we had to back away every time. First time we were ordered to cut the banana trees and we were shot at by sling shots. Then we moved back. The second time we were asked to go to cut the banana trees and we were shot at by sling shots and again and we moved back. After that, we did not go there anymore. Who ordered the 34 villagers to go and cut the banana trees? I am not sure. I think the senior leader of the company. There were eight people in our group who went to cut banana trees. There are many different groups [who work for Kaung Myanmar Aung Company]. We all live in the Phyone Pyaw camp [KMAC staff camp] near B--- village. There are just 13 people in our group in total. The number of workers from D--- village is more than in our group. Eight people from our group went to cut banana trees. There are many other groups [working from KMAC] so I do not know all of their names. They are from many different villages. I just know two people from E--- village. When we went there, villagers were waiting to stop us. Then we came back. What did the company tell you to do if local villagers resisted? The company said that we should not use a slingshot. If we were to use it against villagers, it will be a mistake. According to the conversation we had over the phone, we were not supposed to hurt villagers. That was what I heard. When one of the villagers came to take our picture, I was cutting the banana trees. Then she took a picture and she ran away. Again she came back to take pictures and I accidentally looked at the camera. My face was captured. As a result there are many pictures of my face in the camera. Did the company sue villagers? I do not know about that because we are just ordinary workers and we were asked to cut the banana trees. I just knew that villagers reported it to the local court but I did not know that the company (KMAC) sued the villagers. Nobody informed us about what happened. The place where we live is far away from the company’s headquarters. So the villagers sued the company, right? Yes. The villagers sued the company but we do not know much about the situation because they are the senior leaders of the company and we are just ordinary workers. We just have to do whatever they ask us to do. We just have to go wherever they ask us to go. They do whatever they want to do, so we do not know much about their plans. You were asked to go to cut the villager’s [Daw C---’s] banana plantation. Where does the banana plantation owner now live? I think Daw C--- lives in Doh Saung village tract. However, currently she just lives in her banana plantation area. I started to work at the company on May 6th last year. So I have been working at the company for more than one year. As you have been working at the company, can you share your experiences about what you have done? For example, you were asked to go to cut villager’s banana plantation, what about other plantations? Have you ever been asked to go to cut other trees in other villagers’ plantations? Yes. We have been asked to go to cut the trees in A’wal area [in Htantabin Township]. What kinds of plantations have been planted in A’wal area? 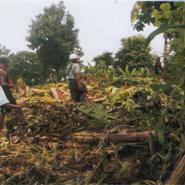 The company confiscated land in the A’wal area and planted a teak planation on the confiscated land. We used to clear bushes [remove weeds and unwanted plants] from that plantation. There were many workers at that site. The company did not usually call our group. If conflict happens, they would call our group to come. Our group is based in three different areas such as field number #12, field number #13 and field number #14. If they need more people when the conflict happens, they come to call our group to solve the problem. They sometimes order us to use knives if necessary. What does your work mainly entail? We usually remove bushes from the plantation. In the rainy season, they ask us to plant teak plants for a plantation. That is all we have to do. There is a person called U F--- in our village. His coffee plantation was confiscated by the company. He does not have any more plots of land to work on. Then he destroyed the [company’s] bean plantation [in retaliation] and planted eggplant on the land. Then Saw Lut Say or [also known as] Ko Nga, who is in charge of the company worker group, asked us to arrest U F---. However we did not want to arrest him because U F--- is our villager. I told Saw Lut Say, “I cannot arrest him. If you want me to stop working, it is fine.” He [Saw Lut Say] said these bean plants have been growing for three years. So U F--- had to pay 10,000,000 kyat [US $7324.20] as compensation. However, U F--- could not afford to pay what he [Saw Lut Say] demanded. U F--- said, “Fine. Come to arrest me if you dare”. Actually he just wanted to discuss the problem face to face with the person who is in charge of the company worker group. Did anyone go to arrest U F---? It was not appropriate to arrest him at that time because that was the time of harvest for bean plantations [and he would lose his crop]. That was the time to get money [from the harvest]. Another reason is that he is one of our villagers. Did you go to arrest him? I did not go to arrest him. I could not do it. [I told the company leaders] do not ask me to do it. Just ask other workers to arrest him. Was the bean plantation completely destroyed? Not at all. The company went to negotiate with U F--- so that the bean planation would not be destroyed next time. U F--- was angry. Think about it. He does not have any plot of land to work on because the company confiscated all of his lands. That is why he cut the companies teak plantation and he planted an eggplant plantation on the teak plantation. At that time about 300 teak trees were cut. Again the company asked their workers to go to cut down the eggplant plantation. U F--- told the company workers, “Cut them all if you want to”. U Than Tun and U Ba Thar had to replant teak plantation after the eggplant plantation was cut. The company asked U F--- to replant the teak plantation but he cannot do it because he owns this land [he refused to do it]. He has worked on this land for a long time since he was young. So this land is his inheritance, right? Yes. This land is his inheritance. He worked on this land when I was a little boy. Then the company confiscated his land? Yes. The company confiscated his land and they made a teak plantation on his land so he does not have any land to cultivate. That is why he cut down the teak plantation. The company wanted to arrest him. He said, “Come to arrest me if you dare”. Actually he just wants to fight the person who is in charge of the company worker group. He does not care much about other workers. Needless to say, U F--- is a person who does not easily give up. He is tough. So how was the problem solved? Ko Nga asked U Than Tun, U Ba Thaung and Ko Ye Min to go and destroy the eggplant plantation in front of me. He asked those three people to tell U F--- on behalf of him, “He can fight me if he sees me on the street. He can also cut me with a knife. Anytime and anywhere”. Ko Nga challenged U F--- to fight him. However, I did not tell U F--- about Ko Nga’s words. The officer in charge of the company challenged U F--- to fight him. What is the name of the officer in charge of the company? His name is Saw Lut Say or Ko Nga. He is of mixed Chin-Karen ethnicity. He is a Christian. He is just a small guy and he wanted to challenge U F---. However, U Than Tun did not go to cut the eggplant plantation although he was asked to. For U F---, it seemed that he was waiting for the challenge and he said it is better if that guy [Saw Lut Say] comes to see me. If you do not do what the company ask you to do will the company cut your salary? I will tell you about that. If you do not do what they ask you to do you will be fired. As for me, I am not a permanent worker. I am just a daily worker. They [company] can hire me or fire me [at will]. It depends on them. Are there any workers who were fired because they did not follow what the company asks them to do? Yes. There are a lot of workers who were fired. I cannot count how many people. Where does U F--- live? He lives in our village. Our village is B--- village, Na Ga Maut village tract. Can you tell me about what you experienced as a worker? Yes. I can tell you. They [the company] asked us to read the four principals of royalty in the morning [principles of the company]. Before we read them out, we have to salute to the Myanmar national flag. Some of the principles of royalty are: “We have to follow the orders and do our duty”. The second one is “We have to be loyal to the Kaung Myanmar Aung Company”. The company makes us act like a soldier and do drills. What are the other two principals of the royalty? I have forgotten it because I have not read it for months. I will try to tell you everything I remember because I am going to leave this job soon. When did you have to go to work in the morning? We have to go to work at 7 am. When did you stop working in the evening? We do not have a fixed schedule for that. Sometimes we stop working at 2 pm. We were once asked to cut the trees in the forest. One person was asked to cut trees in a wide plot of land. The forest is very wide and it is not easy to finish cutting trees in this plot of land. It [the working situation] is comfortable for staff who work closely [and have relations with] with the company. It is very hard for workers who work far from the company like us. We have to replace our machetes two or three times per month. People who are used to cutting trees in the jungle know about this. It is not easy for even me to finish cutting trees in such a wide plot of land. Who gives you your machete? We have to buy our own machete knives. The company provided us machete knives just one time after [we had worked for] four or five months. I have worked for the company for 17 months but the company has only given me machete knives twice. How much money do the company give you per month? I got 120,000 kyat [US $88] from the company per month but since last month I have started to get 140,000 [US $103] kyat. However, new workers only get 90,000 kyat [US $66] per month. What about food cost? Do the company provide you food cost? No. We do not receive money for food. We have to bring our own food when we go to work. We have to pack rice that we cook at our house and we have to bring it when we come to work. Every Sunday is a day off. If we are absent from our work for one day, we do not get a daily wage that day. When the conflict happened between the company and villagers, did they solve the problem in court? I heard that other people went to court but I have never gone to the court. I mean when the company sued villagers, did they have to go and settle the case in court? If so, how did they settle the case? What did you hear from senior leaders of the company? Can you tell me? The conflict happened between villagers and senior leaders of the company but I am not sure whether they went to settle the case in court or not. When the conflict happened, how did they settle the case? Did they settle the case in an informal meeting? Did they negotiate with each other? I have never heard that they settled the case in the informal meeting. So did they go to settle the case in court? Yes. I used to hear that the company sued villagers and they had to go to the court. I just heard about it but I have never been in a court. However, I heard that Saw Lut Say did not want anyone [workers] to tell the truth. If someone tells the truth, they will be fired. What did Saw Lut Say want the workers to say? For example, what do the company staff have to say if they are in court? Saw Lut Say has not told the workers that. I just heard it from other workers. However [if I was in court] I would tell the truth. Even if they fire me, it is fine because I am not a person who cannot survive if I do not work for this company. I can survive if I do other work. I want to tell the truth no matter what. So have senior leaders of the company asked you to speak in court? No. They have not asked us to yet. However, we already know what they will ask us to say. So what will they ask you to say? I think they will ask us to say what he [Saw Lut Say] wants us to say. Did he already tell you what to say? No. He has not told us what to say but we heard it from one of his junior staff. According to one of the junior staff, he will tell lies in court. He will say that he did not order the workers to cut the trees and say that they just did it themselves [without instruction]. We heard like that. However, we do not agree with it [his statement]. So he means [would say in court] the company did not go to ask you to cut the trees. You just went to cut villagers’ trees by yourself. Is it right? Yes. It is like that. He wants to tell lies. This is not [the truth]. We went to cut the trees because we were ordered by the company to do it. If the company did not order us to cut the trees, how would we dare to cut the trees? We only did it because of their order. Who said that [that Saw Lut Say would lie in court]? I do not know their names. There are many workers in D--- village. I think it was one of the company’s staff. There are more than 50 workers in D--- village. There are 23 workers in our village. Some of our workers also have to look after the company’s cows. There is a sign in the plantation. It says “Do not sell the company’s cows and do not look after your cows in this area”. Yet there are more than 60 cows in their plantation. Three workers have to look after their cows. Do you allow KHRG to use and share your information? Yes. I give permission to KHRG. I just told the truth. I did not lie about anything. While the researcher stated that they sued the company it is believed they in fact submitted a complaint to the village head. These field notes are used by villagers to demarcate different plots of land. All conversion estimates for the kyat in this report are based on the August 18 2017 official market rate of 1,361 kyat to US $1.